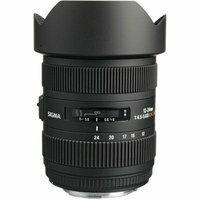 The Sigma 12-24mm F4.5-5.6 II DG HSM is a premium wide angle zoom lens designed for full frame DSLRs but will work with APS-C cameras with an effective increase in focal length. Four FLD glass elements (with performance equal to fluorite) and one SLD element (Special Low Dispersion) ensure premium image quality from edge to edge. Three glass mold elements and one hybrid aspherical lens allow for a lightweight and durable construction while the super multi-layer coating reduces flare and ghosting. The Hyper Sonic Motor (HSM) ensures quick, quiet and accurate autofocusing and also features full-time manual focus override. Suitable for: travel, landscape, weddings, events, nature, wildlife and more.